The Hawk Lapel Microphone by Tactical Ear Gadgets is used by more law enforcement officers (LEOs) across the nation than any other lapel microphone or earpiece. This Hawk is extremely durable, reliable and includes a 1 Year Earphone Connection Warranty. The mic is sensitive and directional, so you don't have to turn or tilt your head to transmit. Just push the button and talk. The kit is lightweight, easy to use and includes two clothing clips to conceal the wires and to secure the mic to your uniform. The polyurethane-jacketed, Kevlar coated cabling provides extended field life. The Quick Release Adapter allows the user to disconnect the microphone from the radio without removing the radio adapter and reduces wear and tear on the radio housing and connector. 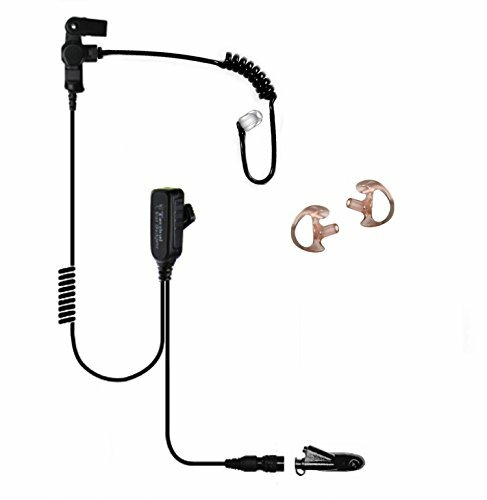 The Hawk Lapel Mic Kit includes left and right medium ear inserts as well a a patented Torpedo eartip. Compatible with Motorola Pro-Series Radios GP1280, 140, 320, 328, 329, 338, 339, 340, 360, 380, 640, 650, 680, HT1250, HT1250LS, HT1550, HT1550XLS, HT750, MTX8250, MTX8250LS, MTX850, MTX850LS, MTX9250, MTX950, MTX960, PR860, PRO5150, PRO5350, PRO5450, PRO5550, PRO5750, PRO7150, PRO7350, PRO7450, PRO7550, PRO7750, PRO9150, PTX700, PTX760, PTX780. If you have any questions about this product by Tactical Ear Gadgets, contact us by completing and submitting the form below. If you are looking for a specif part number, please include it with your message.